Albedo One, the Irish SF&F magazine, has an ongoing project to publish English translations of award-winning fiction from elsewhere in Europe. Their latest issue contains “The Horse Shoe Nail” by Mari Saario which won the 2009 Atorox Award. The translation from Finnish is by Liisa Rantalaiho. Set in Australasia, Birdbrain is the story of a young Finnish couple who have embarked on the hiking trip of a lifetime, with Heart of Darkness as their only reading matter. Conrad’s dark odyssey turns out to be a prescient choice as their trip turns into a tortuous thriller with belongings disappearing and they soon find themselves at the mercy of untamed nature, seemingly directed by the local kakapo — a highly intellegent parrot threatened with extinction. Birdbrain is a skilful portrait of the unquenchable desire of Westerners for the pure and the primitive, revealing the dark side of the explorer’s desire: the insatiable need to control, to invade and leave one’s mark on the landscape. But what happens when nature starts to fight back? Sinisalo’s previous translated novel, Not Before Sundown (published as Troll in the USA), won the James Tiptree Jr. Award. Via World SF News we have learned of the launch of Onirismes, a webzine that will be publishing speculative fiction stories in both French and English. The magazine’s stated aims include, “promoting international fiction among French readers, and vice versa.” We look forward to seeing what they produce. In September Tor will be issuing Twilight Forever Rising by Russian author Lena Meydan (translation by Andrew Bromfield). This is nothing to do with Stephanie Meyer’s blockbuster vampire series, but judging from this interview with Meydan at World SF News it does share a few themes. A comment on the World SF News post appears to suggest that Meydan is a pen name for a group of Russian writers including Alexei Pekhov. Can anyone confirm this? The Finnish fiction magazine, Usva (The Mist), publishes occasional English-language issues. The latest one, Usva International 2010, was published at this year’s Finncon. It contains translations of stories by Katja Salminen, Marika Riikonen, Marketta Niemelä, Carita Forsgren, Marko Hautala, and Tomi Jänkälä. All of these are eligible for our short fiction award. The whole magazine is available online as a PDF. Congratulations to editor Anne Leinonen for promoting Finnish writers in this way. Harmony is an unapologetic example of “stained glass” writing, where the beauty of the prose comes out. At the same time, however, the book isn’t a lyrical excursion on to the far reaches of language—now that would have been murder to translate—but is actually cool and fun. Examination of the cover picture suggests that the translator is Alexander O. Smith who has also worked on Final Fantasy games and the Full Metal Alchemist novels. Over at Wired, Bruce Sterling has run a press release from leading Finnish magazine editor, Toni Jerrman, about the fine Finnish science fiction available in English at the moment. We contacted Toni and asked for information about translations. Hannu Rajaniemi is a very clever guy. There’s no mention of a translator for “Elegy for a Young Elk” so he probably did it himself, but the English publication is, we believe, new this year. We suspect that The Quantum Thief was written directly in English. Johanna Sinisalo’s story, ”Bear’s Bride”, was translated by Liisa Rantalaiho. Tiina Raevaara “My creator, my creation” was translated by Hildi Hawkins & Soila Lehtonen. J. Pekka Mäkelä’s ”Thirty More Years” was translated by Owen F. Witesman. 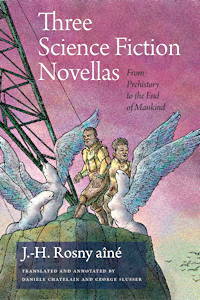 One of the first translated works of 2011 will be a novella by Spanish writer, Domingo Santos. “The First Day of Eternity” will appear in the Jan/Feb 2011 issue of Analog, and will be translated by the editor, Stanley Schmidt, himself. World SF News has more details.